Now that summer is closing out, meals are giving us the chance to use up the last of the beautiful tomatoes and zucchini from gardens and farmer's markets. While I always get melancholy this time of year knowing the bounty is coming to an end, it's also great to eke out the last summer freshness onto our plates. This dish pays homage to Summer and introduces Autumn flavors. It's simply my "Chicken and Vegetables, Almost Cacciatore". I called it "Almost Cacciatore" because it's similar to Italian Chicken Cacciatore in herbs, some methods and flavors but different by the use of ingredients such as Anaheim peppers and zucchini. I also don't dredge the chicken nor do use enough tomatoes to make a real stew-like gravy. Nevertheless, it reminds me of the dish and is a bit fresher and uses more of the last of those beautiful Summer produce. Enjoy the recipe and let me know how you like it. One thing I loved about this dish is its ease. 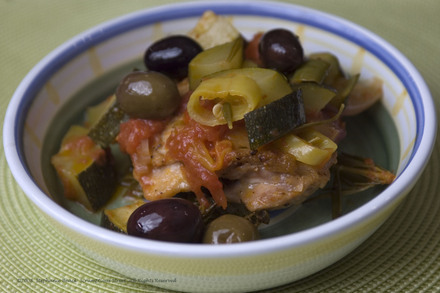 Another is the very unique flavor and texture the olives assume after being baked. They are a little bitter, but they're such a different experience warm and soft. They're necessary to the success of the dish here, in my opinion. 1/3 c. dry white wine, plus 2 T.
2. Season chicken thighs on both sides with kosher salt and pepper. Heat a large skillet with 2 T. olive oil. Add the chicken when the oil is shimmering hot and sear until the skin is golden brown, about 4-5 minutes. When chicken is brown, remove it from the skillet and set aside. Pour in 2 T. of the white wine and de-glaze the skillet, making sure to get all the good brown bits scraped off the pan's bottom. 3. Put all the vegetables and herbs into a large oven-proof dish and toss with 2 T. extra virgin olive oil. Add the chicken and pour the juices from the skillet and the rest of the wine over the chicken and vegetables. 4. Cover the dish and bake in the oven for 40-45 minutes, until all the vegetables are softened and the chicken is cooked until falling off the bone. Serve immediately and enjoy! I make a very similar dish, and I love olives wine and chicken combos, but I am really surprised that you cook if for such a short time - I give mine a good 60 minutes in the oven. Thank you, you did catch a mistake in my recipe! I meant to type in 40-45 minutes. You bring up a great point though. As always, it depends on the oven and the quantity. With this small amount (only 4 small thighs and very little other things in the large pot) and my very powerful oven, this is all it takes for mine to be done. Good point though, make sure you cook until the chicken is fully done, registers internal temperature of 180˚F and meat releases from the bone. That's a better judge than time. Thanks for catching my typo, Merry! This looks like the perfect dish to welcome the cooler days of fall. Sounds delicious!